Did they sniff the air and pick up 'Omens' of what was to come? 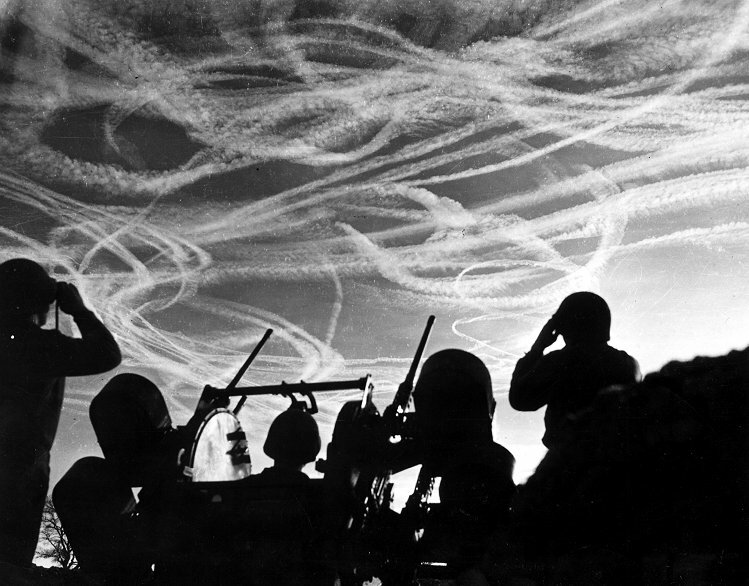 More than 'Omens in the Sky' at the Battle of the Bulge. After 1871 when Germany became an Empire, rather than a hoytchpoytch of Duchies, Reichs, Leagues, states and small city states. The Deutsch Reich was declared at Versailles in 1871 after the Prussians took Paris subsequent to the French attack which resulted in the Franco-Prussian War of 1870. Many young German men were raised to peaceable, to decency, to the grace of Christian belief, to values other than the mercenary expediencies of political violence which the zietgeist brought into play, put on the platter on offer as if they were the only power daydreams for more than fourty days and fourty nights of national temptation. But Britain did not want Germany to rise, seeing the Prussian work-ethic as a threat to its global economic prosperity and dominance. The treaties of Protection, Tarriff and Taxation that England made with France and Russia, were designed to check and punish the German nation in advance, as if they had not already woken from, and could be drugged back into their lapsed centuries of productive peace - in their wine and beer, their poetry, their theology. their philosophy and their music. After 1870, all that was achieved by British attempt at playing world policeman against Germany, and to forward their own sometimes doubtful if not corrupt advantage, was too annoy Germany, to infuriate the Germans in their rising and pride, first to the point of anger, and then, to mushroom out of its darker shadow side, into the militating attitudes of chauvinism, added to which came the arming of itself with the ruthless politics and the progressively modern technologies of violence. Many of the young men were nevertheless disgruntled with the way in which their German Empire was going. An aggrieved and militaristic social climate is anathema to some natures, as it is anathema to many beliefs. One thing many objected to was the compulsory military service brought in under the militaristic and Prussian mindset of the time after the Unification. Many young men left Germany, or Austria, before it ever came to war. A segment of those departing came to AUSTRALIA. These were young men leaving Deutschland ANTI-WAR in three senses. 1. They were set Against the Militarism and the Martial Chauvinism of their time. 2. They left anti the War, before the War, realising early on what it was that was likely to come. 3. Avoiding Conscription: many did not want to participate as conscripts under a militaristic regime, and choose to flee, refugees from what they saw as the oppression on an attitudinal pressure-peerage. or what was often seen as the 'Prussianised' Compulsory Military Service. Young men trickled out through the ports of Germany, Holland and Belgium. Great numbers more went via England. Some even crossed the Alps and embarked from port in France and Italy. I am here concerned with those who came to AUSTRALIA, though my study is really only concentrated in the Melbourne region of Australia. Two World Wars where Germany - and Germans - were the enemy - saw them permanently estranged from both their people and their heritage. After the Unification of Germany under Prussia in 1870/1871, when Universal Conscription was brought in across all the States of Deutschland, the pattern of emigration from Germany to Australia changed. Instead of the earlier pattern of the majority of settlers arriving in families, young single men started to arrive, young men who were at odds with the increasing militarisation of their Fatherland, and also often at odds with the Rampant Chauvinisation of German Social Life. GO! He said, and they went, some went very far away, and not where he expected. 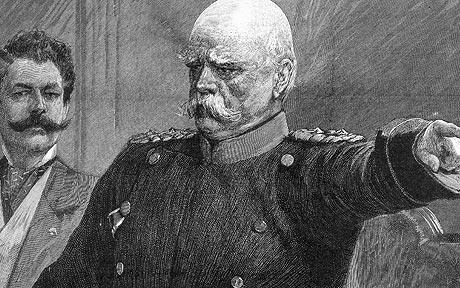 Count Otto Von Bismarck was credited with being the power that worked the Unification of Germany -and maybe, also, its 'BLOOD & IRON' Militarism. Many of these young men were also avoiding military service, but the sacrifice they made for their principles was also to be distanced, even disenfranchised and disowned by their families in Germany. And often, then persecuted as Enemy Aliens in Australia. 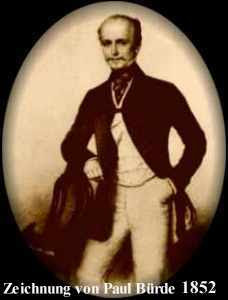 One significant aristocrat among this tide of young German men coming out of the world's sea into Australia, was Erich Hermann Conrad Heinrich KILLISCH Von HORN, the son of Countess Marie Antonie nee WEIGEL, & Count Hermann Theodor Killisch Von HORN (1821-1886), one of the leading financial newspaper proprietors in Berlin, Brandenburg, Prüßen (Prussia). Erich H. C. H. KILLISCH Von HORN was one of the four sons, of the five children in his family. He was the third son and fourth child of the family, and, as is often the way of younger sons, appears to have taken a viewpoint somewhat at odds with his elder brothers. As a young man of the age of nineteen, the Berlin Newspaper Baron's son, Erich Hermann Conrad Heinrich Killisch von Horn arrived on the ship "SWANMORE" in Melbourne, Australia, in December 1888. Typical of many an Anti-Militaristic Australian émigré from Prüßianised Deutschland, when he came to marry, it was to a non German girl. Erch Killisch von Horn was married to Hovell's Creek, Lara, Victorian-born, Maria IRWIN, daughter of John IRWIN from Braunton, Devonshire & Jindivick, and Susannah WARE from Chiddicott, Devonshire. 6. Arnold Royal Georg Killisch von Horn, b.1910 Buln Buln - 1916 Ringwood, Victoria. Herman Conrad Erich Killisch VON HORN was born in Germany in 1865, the youngest of five children. His father owned the Berliner Zeitung newspaper and the family live din very comfortable circumstances. Erich matriculated at fifteen, but did not go on to university. He was unhappy with the militaristic atmosphere of his home country, so with the help of his aunt, he left Germany for Australia in 1886. He avoided military service, but his actions prevented him from being able to return to his home country until he was pardoned many years later. While on the ship he met up with a Swiss doctor, David Trumpy, who taughthim some basic English. On arrival in Port Phillip he accompanied the Trumpy family to the area (Warragul) and he worked as a labourer in the Buln Buln district. In 1895 he married Maria IRWIN, the daughter of a well-known local family. He was naturalised in 1904. They had six children, but only four grew to adults. In 1900, on the death of his father, Erich inherited the title and he received a fifth share of the paternal estate. He was able to purchase ‘Belmont’ in Brandy Creek Road, Buln Buln, extending the house and buying neighbouring property until he had about 300 acres. He lived the life of a gentleman, employing a Mr Walsh as manager. There was an extensive orchard and a flock of Merino sheep. He also raced greyhounds. He had flashy horses to pull his buggies and jinkers and later owned one of the first motorcars in the district, a Talbot. His children were educated by governesses at home, but the Count supported Buln Buln State school. Erich became interested on civic affairs. He was a Warragul Shire Councillor from 1907~1915, serving his term as President in 1910~1911. He donated the council table and chairs during his term as president. He was involved with the formation of the Agricultural High School and donated implements to assist the farm. He served on the Committee of Management of the West Gippsland Hospital and was the fourth President. The Agricultural and Horticultural Societies also had his support; he was President from 1912~1915. With the outbreak of World War 1, the money from Germany ceased and public feeling against Germans amounted to hysteria. He was abandoned by many of his friends in Warragul and resigned from or lost his various public offices. The family sold the farm and left the district, moving to Ringwood, and later Nunawading, where they bough orchards, which were later subdivided. His German origins were not as important there and he no longer feared internment. For all his anti-war principles Hermann Conrad Heinrich Killisch von Horn found his lot was to be a farmer in Buln-Buln, near Drouin, Gippsland, and later an Orchardist near Ringwood, Victoria. While he was in West Gippsland he stood as a local councillor for the North Riding in Warragul, where he took his turn as Shire President. He was reknown for his great generosity in many public endowments. But, he lived saddened, even mortified, by the enmity and hardness of both sides in whole period of the Two World Wars, wars he lived to rue as a great and personal tragedy. NOTE: The race hate and prejudice against the distant 'HUN' had been whipped up by the Australian Press and by little local demagogues to the point that it literally encouraged the enmity of ordinary Australians against their neighbouring Germanic-Australians to such an extent that even model citizens had, as it were, to once again 'prove themeselves' and watch every word, for every tiny hint of disloyalty would be seized on as 'Alien Sympathy', if not that, then, they would suspect 'Traitorious Intent.' So, many an Anti-militaristic German-Australian emigree found themselves having to give allegiance to the European and far-distant Britian, when they really intended their loyalty to the antipodean Australia under the British Crown. 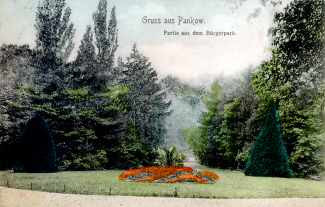 Picture of the Killisch Von Horn Park out of Berlin. Sir - I ask permission to announce for the public information the fact that I am a British subject owing, neither allegiance nor duty to Germany, nor my other nation. My friends know me to be what I am - as loyal to the throne of England as any of her subjects - but, for those who do not know me, may I shortly state the following facts. For 30 years I have lived in this country during which time I have had no dealings beyond it, or with those who were not of it. I was naturalised in 1889 and again upon the foundation of the Commonwealth. I have endeavoured, in a practical way to show my sympathy for Belguim in her distress and have given my whole-hearted support as a loyal British subject to the efforts being made to render assistance to or furnished comforts for our Allies in the field. I am neither more nor less than a loyal citizen of Australia and a loyal subject of England. P.S. - Will you kindly forward enclosed cheque- £10/10/-to the British Red Cross Society, which I take this opportunity of enclosing. [Unfortunately, Von Horn's gift to British charity now comes across in some sense as a voluntary bribe to face off or avoid any oncoming accusation or persecution from the over-Britishified, the mad for Brittania and its Empire-Day drugged populace. 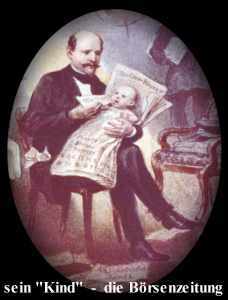 Hermann Theodor Killisch Von Horn pictured in all the glory of his 'baby' a Stock-Exchange Financial Newspaper. Erich Killisch Von Horn and his wife had six Australian children, at least two of whom died in infancy. He raised his children to be articulate, and with a mentality that was neither militaristic, nor cowardly. The Courage and nobility of his thought was passed on to his children and the following essay shows that he not only rejected the selfishness behind the militarism of his fatherland, he was willing eager to encourage a stand against it. This might be why his family in German cut him out of all acknowledgement. This essay was published on page four of the Healesville and Yarra Glen Guardian (Vic. : 1900-1940) on Saturday 15 April 1916. PRIZE ESSAYS. Because it is one of the first duties of man to defend his own home, and in times of national peril the evil which threatens the country as a whole threatens every part of it. True patriotism is based upon the love of all that makes home dear, with the addition of gratitude for all the gifts conferred upon us by membership of a great Empire. Because it is the duty of every man to do whatever he can to help on the cause of Right, and though we are no doubt biassed in favor of our own country, yet most of the civilized nations among the neutrals admit that this war has been deliberately forced on (us) by Germany for her own purposes, and that her professed ideals are selfish in the extreme. Since the victory of the Central Powers would mean the wide spread of such doctrines, no one who desires to see the triumph of Righteousness over Evil is justified in doing less than his utmost to secure that victory. Because the time has come when victory can only be won by opposing men in over-whelming masses to the enormous masses Germany can send into the field. Reinforcements are needed now and continuously, and each man is responsible for himself and all those he can influence. Because either failure or slackness in responding to the call for men implies that the blood hitherto shed will have been shed in vain. Another reason which should weigh with all who are eligible is that apparently the day of conscription is not far off. Those who will leave their country to demand - as a debt - what at present she accepts as a gift, are depriving them-selves of something which would be a great joy and an abiding honor to them. Moreover, in all likelihood the duty which is so repugnant to to them will ultimately have to be performed, shorn of all that would to-day lend grace and dignity to it. The reasons why those who can go should go are so many and so varied that we cannot enumerate a fraction of them. They are based both on the comparatively low ground of expediency, and on the higher and nobler ones of Gratitude, Patriotism, and Love of Right. - J. KILLISCH VON HORN. Erich Killisch von Horn died in the southern autumn of 1941 in Balaclava, Melbourne, in the thick of World War Two, and, for him, as for many German-Australians, the second period of sustained mortification and grief over Hitler's war. That was a war that saw the German nation of his birth become the evil and stereotypical enemy of the free world for much of the century to come. PERSONAL: The death occurred last week, at Balaclava (Melbourne) of Count E. Killisch Von Horn, once well known in Warragul district and other parts of Gippsland. Before the world war of 1914-18 he was in regular receipt of very substantial monetary remittances from a wealthy estate in Germany, and was noted, locally and in various parts of the State for lavish generosity. For some time Count Von Horn was a representative of the north riding at the Warragul Shire Council table, and had a term as president. The handsome presidential chair, which now forms part of the council chamber furnishings, was one of his gifts to the municipality when its president. He was also a leading member of the Warragul Race Club, when it was a flourishing body - many times its president - and prominently associated with the agricultural society. One of his costly hobbies was coursing, and he always had running in his name tip-top greyhounds, with which he won many of the biggest State events, including a Victorian Derby and Waterloo Cup. His dogs were trained by the late Mr. Walsh, at Buln Buln. Whilst residing here, the Count was proprietor of the Belmont Estate, on the Brandy Creek Road, near Warragul. A ONE WAY TICKET, AND A SINGLE AT THAT? Between 1875 and 1915 when these young German men immigrated, this was usually a one-way trip. Their act of leaving Germany was usually a one-way ticket, whether they knew it at the time or not, for the events of world war and attitude of the time meant that their self-banishment it soon became permanent. And before long they became Australians, often marrying girls of British or Celtic stock. What they left to their Australian offspring was a Universal pacifistic attitude and an anti-war legacy, which is largely unremembered, quite uncelebrated, if it is not even, completely unknown, either in Australia, where they were very often persecuted as enemies, or in Germany, where they were very often seen as traitors. Their often lonely heroism and solo action is quite at odds with the spirit of the War Memorials in Stone raised across Australia, just as is at odds with our annual Anzac or Remembrance days. The very often noble internationalism of these German-Australians was at odds with the rowdy flag waving of British Empire ra-ra and bias some Australians in the early twentieth century, just as it would be with the jingoistic Australian flag waving nationalism of the early 21st century. For they were very often soldiers not of war, but of peace; not of limited nationalism, but of global dignity and hope. For these thousands of young emmigrant German-Australian men had already declared their desire to defeat the war, and their strong opposition to war, by voting with their whole beings to live on the other side of the world. K. Wilhelm KNOLL, lifelong pacifist, primary producer, communitarian. I know of this story in the first instance because my own great grandfather, Karl Wilhelm KNOLL (1870-1953) was just such an immigrant. Wilhelm Knoll arrived in Port Melbourne, Australia in April 1893 on the steamer "KARLSRUHE" having come by way of the Suez after departing from the German Port of Bremen. He was then aged just 22, though the ship's manifest records his age as 30. My reading of this blatant age discrepancy is that he deliberately raised his age on paper to avoid detection, to escape the scrutiny of likely Military Recruiters' Agents watching the ports for departees and refugees fleeing from their bullying edicts of control. At a guess, by 30 years of age a young German man would be presumed to have completed his military service, whereas at 22 or 23 he would presumably have enlisted and about to go into military camp - or else already well within its hold. - If this age feint was a lie on Knoll's part to be shed of what, to him, was an obnoxious militaristic culture, and so to shed himself of a chauvinistic and militarist Deutsch Reich Stadt, it would also be a mature canny ruse, a ruse made of dire necessity to escape from a miswrought and alientated culture of overbearing suspician and distrust. Also, it comes to be seen as exceptional, for it is the only known untruth or deceit that Wilhelm Knoll would ever be known to make. When Wilhelm Knoll embarked from Bremerhaven, it was as one of only five passengers on what seems to have been primarily a cargo ship. All five passengers were single young men of an age between 20 and 30 - all young men of a type normally to found at that time doing their conscripted military training. So, it seems likely that Wilhelm Knoll and his fellow passengers were familiar, maybe even engaged with, a clandestine anti-conscription movement, as one that educated young men into the ways and the dangers of escaping the universal drafting into the Deutsche Reich Military could be found by those asking in sympathetic need. 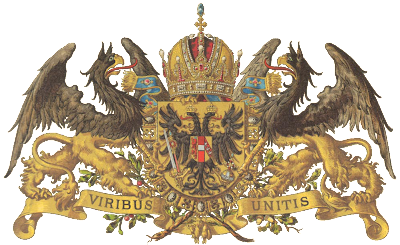 His loyalty at that time, as a southern German, was not likely to be with the Hohenzollern Emperors, who had been adopted into the Deutsche Reich, from their northern Prüßen (Prussia), but a loyalty to those closer at home. He came to live and the light of his mother's differing mentality that was conversant where he was born. He was born in 1870, and, so, before the German Empire came into existence, among the vineyards at Thalhausen, a tiny hamlet near Markgröningen, northwest of Stuttgart, in the crafty and inventive, the warmer and gentler Kingdom of Württemberg (Königreich Württemberg). 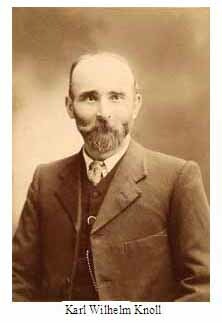 On disembarking in Port Melbourne Wilhelm Knoll went more or less immediately up to the Yarra Valley and took on work on the Dandenongs hinterland farms of George Parker, a pioneer at South Wandin. This was a district of permanent rivers, of hills and streams, with a backdrop of mountains, similar, uncannily alike to the homeland of the Neckar region of the South German Württemberg Knoll had just departed. It seems obvious today, when we can compare geographies so easily on the internet, that he did not find fault with the reality of that kind of stream and mountain farm-plantation physical landscape. It must have beed something of the mental and social landscape in Deutschland that was found wanting. For Wilhelm Knoll was a gregarious man whom people found to be good company. He was embraced into the family of his employer Parker, who sold him thirty acres of hs own good Silvan land, and was taught English by his employer's son-in law and neighbour, Vancouver Island-born Canadian, Ted Reeves. Knoll was married in 1897 to a young relative of his employer, Ada Jane Hollis, an Yarra-Valley-born girl whose family were the furthest-out South Wandin pioneers. The pioneer Hollis family came of a heritage of ancient farming folk who had become gentrified as yeoman and Oxfordshire landowners along the River Thames. In anticipation of his marriage Wilhelm Knoll wrote home to Germany in 1897, requesting the dispatch of the rest of his due and value in an inheritance, but after a fobbing-off and dismissive sob-story of a reply, wheren his brother uses the hurdle of his far-off Australian remoteness, and Wilhelm Knoll's own self-banishment from Deutschland as excuse enough to deny him his due, he never wrote again. He had no further contact with his family in the Circle of the Neckar Valley, and never returned to Germany. It is now known that back in Germany, his brother Jakob Knoll named a son Karl Wilhelm Knoll, as if to replace him. By 1896 Wilhelm Knoll was a key player in his local community at South Wandin, which became Silvan, and he was a force in the rebuilding of the local Mechanics Hall after the first one was lost in the bushfires of 1898, and then, to the building of a district church at Burleigh, Silvan South, where there was formerly no place of worship. He was a man who gathered people and community together, both at home, and in the wider district where he became a respected pioneer. When the Great Spring Snow of about 1903 destroyed the whole seasons raspberry crop in Wandin South, Knoll worked as navvy in a Goldmine in Campbells Creek where his brother-in-law, the New Zealand-born Engineer Albert Stewart, was the manager. Later Wilhelm Knoll supplimented his dirt-farm income by tendering for Lillydale Shire contracts for maintenance and repair of the infamously terrible roads, which were often reduce to deep-rutted tracks and quagmires. He used do all the work by hand. He would dig the rut-walls down with a shovel, and fill in potholes from a horse and dray. The respect that he garnered by being a generous neighbour, churchman, friend and citizen, might have protected him somewhat from the persecution which he also encountered. That did not stop him being interviewed and interrogated and watched by the authorities, as evinced by the MP/16 file in his name held in the Australian National Archives, but no disloyalty, no accusation of his hateful detractors and persecutors could be made to stick. Anyway, he consistently worked with a passion to produce food of his orchards, his berry vines and vegetable crops, so that his uber-providence went to ameliorate the suspicion too often engendered in the violence that lurks in the shadows of a community living on war-footing. But not one son of his went to their war, not one grandson of his, went to a second world war, in the aftermath of his early departure from a looming European horror. UBER AUSTRALIAN : and then the FORGETTING ! This forgetting, while helpful for the individuals at the time, does not do justice to the greater passion and truth of the full story. This silence needs now to be broken, and the reality of the courage and principle underpinning the human story of the Germanic exodus and expatriation needs to be exposed. Wilhelm & Ada Knoll had five Australian children. He applied himself as a good servant to Australia in uber-hard work, in bountiful productivity. Likely, he did that also as a bastion of integrity in self defence against every potential dobber, whinger or seeker of enemies, so confounding even the known haters in his locality. His noble train went out the year mine came, as he died in 1953, the year I was born. But his non-violent, non militaristic attitude was imbued through his descendants. He is buried with his wife Ada, in the district he pioneered and served, in Lilydale Cemetery. When he died it was the local Wandin Riding Councillor, Harold Parker, a man made entirely of English-Australian ears and cultural prejudices, a one time Lillydale Shire President, who nevertheless wrote and initiated the publication of a grand obituary of tribute to him in the Lilydale Express, wherein he praises Wilhelm, or, at least, an 'Englished' version of him as 'Bill Knoll' as a community visionary, calling him "the hardest worker ever to settle in the district." My father remembers him pausing from the weeding of his offspring's farms which he undertook up to the day of his death, to ask in his Schwabian Württemberger German accent, probably with delight and mischief, certainly with some ironic cheek in his eye, "Hard at it, are you?" Many a peace-loving, Anti-war German refugee and Australian émigré then suffered prejudice and persecution in Australia. But that was very often borne in sacrificial silence because they knew they would be likely to suffer a worse persecution on any return to Deutschland. SENSE, SENSITIVY, or OVERSENSITIVITY ? In the letter above Johann Wilhelm CARL writes with a sense of finality - of the resolve and yet, the heartache, of the breach inherent in his youthful decision on emigrating:- "Alienating me for ever from obligations, privileges, &c., under German Rule." Fact is, sensitive young hearts were in a quandary; the minds that rejected the martial chauvinism and militarism of Germany, and made decisive moment for real change they could be sure of, did not revile from the breaking sense in their hearts, of depths which loved their fatherland and its goodly inheritance. They did not depart easily, and not without the tortured tearing of the bond-strings in the blood's double-binds, beyond reluctance. The longing was both to evade neighbourly persecution, and to evade Authoritarian Internment, so, back then, German-Australians, if they wanted peace as well as freedom, had to live at the uttermost heights of a demanding conscientiousness. This demanded conscientiousness made many German Australian settlers into model citizens, and asked them to step up to ways of being and relational places of real character and service to their people, whoever they were. German-Australian émigrés who were Refugees and Aliens of German Militarism and Martial Chauvinism then too-often suffered the persecution and prejudice rising out of Martial Hardening and Chauvinism, or was it just the pettiness and hatred of their fellow non-German-Australians ? Their Australian families often suffered the same hateful targeting. Many petty-minded letters were published in the newspapers. However, such as they were answered, and those representing the better British spirit -of magnanimous largesse- came out to silence the pettifloggers with the bigger-hearted truth of the universe. Such a one was F.S.G. … If Machiavelli was right in insisting that a wise man ought to take the example of a great man who excelled in achieving a great exploit, then Bismarck will continue to be worthy of study. Steinberg balances the achievements, however, by analysing the flaws: a rebuke from the Kaiser sends Bismarck to his sick bed; there are prolonged absences from Berlin at his estates; gluttony gradually erodes his health; mendacity is routine and bullying a constant. Worse, the system of Prussian government bequeathed by Bismarck on Germany, with its weak Reichstag and omni-present Kaiser, glorification of martial values, anti-Semitism, and intolerance of dissidents, proved fragile indeed. So, the bullying culture, the disregard of principle, disdain for matters of conscience, the intolerance, and, above all, the ruthless valorisation of power, was already part of the mental furniture of the Reich that swamped all the other Germanies after 1871. By the time 1933 came, it was more or less too late for departure. The effective vote, was with ones being, and that was made by those who voluntarily went into exile. The conscience-driven sensitive Germans became the Germanic diaspora. Many early dissidents of fascism, and so, of Nazism, were those who left, who emigrated after 1871 and before 1914. They departed from the Deutsch Reich early on, when their sensitivities were breached as its martial bullying was first encountered. 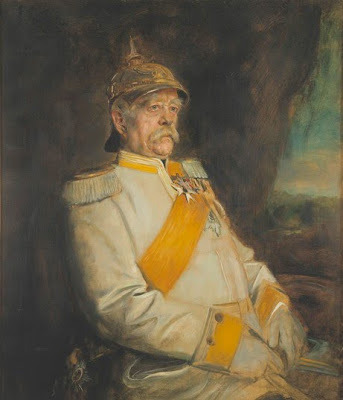 Count Otto Von Bismarck painted as an old man, and in all his fine regalia, yet exhibits a sad glory, as if seeing the wrath to come in his aged premonitions. In fact, given the fact of the ongoing sense of shame which unfortunately encumbers Deutschland, and many things German, from a proper expression of goodly pride, - because of the consequences of its own sometimes inglorious past, - given to chauvinistic, and then, fascist militarism - then, the legacy of high good conscience and devout integrity than can be found among many of Deutschland's multitude of expatriate sons and daughters, might provide a way into full expression of a proper Germanic self-valuation, even to acceptance of a Universal 'Germanity' of noble and challenging consequence. I am proud to have a German surname. I am a proud Australian with a German surname to be proud of the same as my great grandfather was. He never considered changing his ancient good German name, either by clandestine pseudonym, nor by official deed poll. Yet the surname's pronunciation was changed from the German to the English, the likely cause being the Knolls gregarious acceptance of the everyday parlance in the Australian settler community in all its Anglophone defaults, given to expressing things as their parochial English ears gave them a limited avenue of hearing. But he was a proud and noble product of Germany. He never Anglicised his name, and his tombstone of 1953 in the Victorian, Australian, Lilydale Cemetery reads, not Charles William as many a record attempts, but: Karl Wilhelm Knoll. The Germanic Diaspora are part of the German story, part of the gift that Germany is to the world. The following German-Australians, concentrated for the most part in the State of Victoria, are a small part of that global gift. BY UNITED FORCES: - But the German Eagles in Pugnacious Fighting mode alienated many out of their own nest, to fly off that crest. Here, I hope to include a list of the names of arrivees after 1870 and before 1919, some of whom will be leaving Deutschland (or the Österreich - the Austro-Hungarian Empire) in frustration, in protest, in rejection, of a current zeitgeist of chauvinistic militarism. 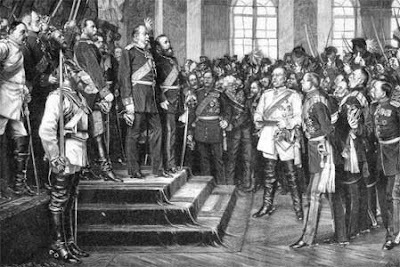 A militarisic chauvinism had entered the zeitgeist of Central Europe even by the 1870s, and was pushing to dominate the older cultures of the Deutsche realms. Many young men of that other culture departed. I am keen to hear from the families of those listed here, following, and select and highlight some of them, to tell their stories. - these men (and women) may be those who left the Germanic Theatre in protest at the Militarism of that time. I have selected names associated with the Melbourne region, Victoria, Australia. AMBIT LISTs : Note that these Alphabetical Lists are something of an ambit collection, comprised of various sources, including the German-born who married in Victoria after 1870, those men known to have arrived after 1870, and others - found variously , via internet contact, or through newspaper articles, or Naturalisation Papers, so in this initial in-gathering ambit some few might be netted who do not belong. Libanius Redux, You have whetted my appetite, and now I want a return of a proper libation! Tell me more about your uncle. What was his attitude to militarism? I can find no Australian Naturalization record for Jean Arnold Hesse, although he married in Victoria. Why did he go to the USA? I am not sure he did go to the US.. it was his wife Ellen Watt Stephens who supposedly went.. he had abandoned her after one month of marriage in 1884.. however I found an Arnold Hesse in Nashville TN, who for some reason (and I cannot penetrate the Ancestry.com Iron Curtain) is linked to her. Hi my name is Merryn Smith I just discovered my great Grandfather Karl Johann SCHMIDT (born Baden, married Alice JOHNSON 1896 Vic) on this list!. My sister and I have been looking for these two for a long time as my Grandfather (born Karl Johann Schmidt but changed his name to Carl John Smith) ancestry has always been a mystery in the family. Your sensitive explanation to what these men went through goes a long way to helping us understand why my Grandfather was placed in the Ballarat children's orphanage, along with his siblings. Do you have anymore information about him? Thanks for a lovely site!! My G.Grandfather appears in your listing. "Friedrich SCHEPKE / SCHAEPKE - von Prussia, married Sophie RASMUSSEN 1907." During WW I, he changed his name to Schipkie and claimed to be Polish to escape the hysteria directed towards those of German ancestry at that time. Some branches of the family have subsequently changed the name to the anglicised version Shipkey. Greetings WDK - My blogpal Hels has written a Boer War post here. Hello, I am trying to research my 3rd Great Grandfather Heinrich Schmitdt AKA Henry Gotlip Schmidt AKA Heinriete Schmidt AKA Henry George Schmidt AKA Gottlieb Henrich Schmidt AKA Gottlip Heinrich Schmidt. He came to Australia in 1879 on the ship ATALANTA to New South Wales. He became an Australian citizen on the 29th of December 1900 when he was 41 years of age. He resided in Ashfield. As i am fairly new to genealogy i was wondering if you could please point me in the right direction where i can find where he left Germany to Australia. I am having difficulty researching the ship Atalanta. Any help would be much appreciated. Hi there, I am a great great granddaughter of Charles ( you have Carl) Bernhardt Hahnel. Great information you have on him, I have found his naturalisation papers and many other information on him including photos. One thing I am having a problem with is trying to trace him back further then himself, and The ship he has stated on his naturalisation papers does not have him listed as a passenger.. He and another line of his family have been really hard brick walls. If anyone out there is also related, I would love to hear from you!